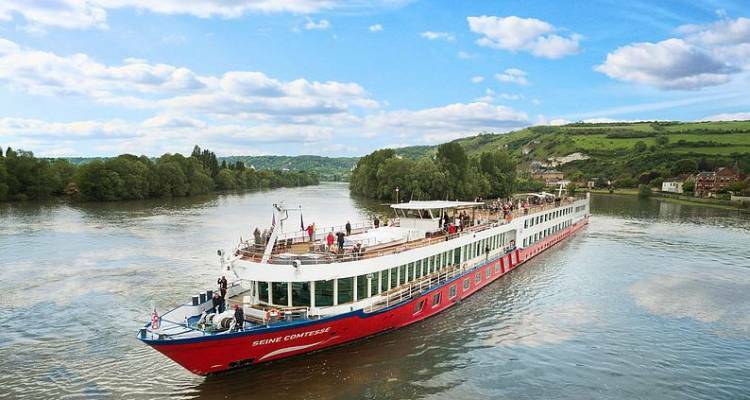 Our MS SEINE COMTESSE is a true countess. She glides through the romantic Normandy elegantly and in style. Generously furnished cabins with a lot of comfort are waiting for your duration of the trip. Fantastic panoramas are not guaranteed by large panorama windows in the cabins, but also in the other public areas. Frances cuisine is world-famous. And naturally you will also experience that on-board. Dishes prepared fresh every day are always a poem and round-off the unforgettable travelling experience duly. The cabins have an approx. size of 15 m² and have larger panorama windows that can be opened in the deluxe cabins. They offer beds positioned next to each other that can be pushed apart on request. The cabins are furnished in style and comfort with an air conditioning system that can be regulated separately, shower/WC SAT TV, telephone, hair dryer and safe.